Do much more than improve the appearance of your eyes. Eyeliners continue to be one of the best enhancers eyes can ask for whether we're talking about pencils or water based eye liners but, the intensity, endurance and quality make all the difference and here is where you'll notice you have it all. Provoc brings to you a high intensity, gel eye liner which is easy to glide on and is quite long-lasting. 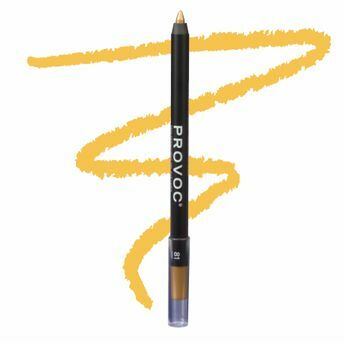 Get that perfect dramatic, smokey eye look with ease and outstanding high pigmentation in a single swipe and smooth application with the Provoc Gel Eye Liner. These creamy, gel based eye liners come in semi-permanent formula and are absolutely waterproof! Explore the entire range of Eyeliner available on Nykaa. Shop more Provoc products here.You can browse through the complete world of Provoc Eyeliner .Alternatively, you can also find many more products from the Provoc Semi-Permanent Gel Eye Liner range.